In a controversial 2010 deal, ARMZ, a wholly-owned subsidiary of Rosatom, the Russian government-owned nuclear energy conglomerate, obtained a controlling 51 percent interest in Uranium One. That’s the Canadian company at the center of the Clinton Foundation donor scandals. The deal appears to have been approved by the Committee on Foreign Investment in the United States (CFIUS), an inter-agency committee of the federal government, 52 days after Uranium One’s shareholders signed off on the takeover. Uranium One’s shareholders approved ARMZ’s acquisition of controlling interest in the company on August 31, 2010. While neither CFIUS nor Uranium One have publicly stated the date the ARMZ-Uranium One transaction (CFIUS Case No. 10-40) received CFIUS approval, Breitbart News believes the most likely date that took place was October 22, 2010, 52 days later. The CFIUS review and approval process, as established by law and regulation, takes 75 days from the time the parties involved in a “covered transaction” with national security implications where the acquiring company is wholly owned by a foreign government, as was the case in this transaction. In 2010, the State Department’s representative was former Assistant Secretary of State for Economic, Energy and Business Affairs Jose W. Fernandez, now a partner with the prestigious Gibson Dunn law firm. The Treasury Department was represented by Marisa Lago, Assistant Secretary of Treasury for International Markets and Development. So Uranium One and ARMZ could have jointly filed such a notification with CFIUS some time in August prior to the August 31, 2010 approval of the takeover by Uranium One shareholders. However, the 75-day clock does not begin the day the Staff Chairperson receives the notification. The Staff Chairperson must first “inspect such notice for completeness.” Given the lengthy list of required information found in Section 800.402 of the regulations, this may take some time. Only after the Staff Chairperson has confirmed the voluntary notice complies with Section 800.402 and “disseminated the notice to all members of the Committee” does the 30-day initial review, the precursor to the 45-day investigation, begin. Breitbart News contacted Aimen Mir, currently the Acting Deputy Assistant Secretary of Treasury for Investment Security, but in 2010 the Staff Chairperson for CFIUS, the individual with the statutory and regulatory authority to initiate case files on “covered transactions,” to determine the date on which the initial 30-day review period for the ARMZ-Uranium One transaction began. Breitbart News also asked Mir to confirm that the ARMZ-Uranium One transaction went through the mandatory second stage 45-day investigation phase required in cases where the acquiring company is owned by a foreign government, but has not received a response. Note the key phrase “no unresolved national security concerns,” which appears in both the final CFIUS regulations promulgated by the Department of Treasury in November 2008, (Federal Register Vol. 73, No. 226, November 21, 2008, pages 70702-70728) and the January 29, 2013 letter to the NRC from Uranium One. On December 27, 2010, Ul Inc. [Uranium One] and ARMZ announced completion of the 2010 Transaction. . . 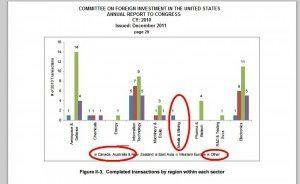 In addition, in August 2010, Ul Inc.[Uranium One] and ARMZ jointly filed a notification with the Committee on Foreign Investment in the United States (“CFIUS”) regarding the 2010 Transaction in CFIUS Case No. 10-40. This strongly suggests CFIUS completed its review of CFIUS Case No. 10-40 and approved the covered transaction between ARMZ and Uranium One on October 22, 2010. If ARMZ and Uranium One notified CFIUS of their covered transaction on August 6, 2010 (a Friday) and CFIUS Staff Chairperson Mir completed his review of the voluntary notification the very next business day (August 9), the earliest the 30-day review could have begun was August 10. That review would have been completed on September 9. The 45-day review would have begun on September 10, and, by law, could have extended until October 24. Such a timeline would be consistent with CFIUS review that followed the 75-day statutory timeline and delivered an approval on October 22. However, the actual date in August when ARMZ and Uranium One submitted their notification to CFIUS is not known, nor is the amount of time it took the CFIUS Staff Chairperson to review the notification for completeness. At the time of the transaction, Uranium One owned 20 percent of all uranium deposits in the United States. Uranium, of course, is a key strategic national security asset for the country, since it is the fuel used in nuclear power plants and nuclear weapons. Hillary Clinton, then the Secretary of State, may need to do more than clarify the timeline for the CFIUS approval of the ARMZ-Uranium One deal. She may also have to explain whether she failed to disclose to Assistant Secretary Fernandez, the State Department representative on CFIUS, that several executives at Uranium One made millions of dollars in contributions to the Clinton Foundation immediately before and after CFIUS reviewed and approved the ARMZ-Uranium One deal, CFIUS Case No. 10-40, in 2010. According to the company’s 2010 annual report, Uranium One executives exercised options on more than 13 million shares of common stock that year. As a result of these stock options, as a group Uranium One executives received a one-time dividend in excess of $14 million. That dividend was a very sweet financial incentive for Uranium One executives and shareholders alike. ARMZ acquired the remaining 49 percent of Uranium One through its ARMZ subsidiary in 2013 for $1.3 billion, or $2.86 per share. Telfer remained on the company’s board until February 2015. If Secretary Clinton failed to disclose the ties between Uranium One executives and the Clinton Foundation to Fernandez and other representatives on CFIUS, she may have violated the terms of the 2008 Memorandum of Understanding she signed with the Obama administration that was designed to prevent conflicts of interests between her decisions as Secretary of State and donations to the Clinton Foundation, headed by her husband, former President Bill Clinton. She may also have violated governmental rules regarding ethical conduct and recusal of government executives, and possibly the law and regulations governing CFIUS. Notably, Fernandez did not definitively say that Mrs. Clinton did not communicate with him about the case. Nor did he say that anyone on her staff, or his immediate superiors who reported to Mrs. Clinton at the time — Under Secretary of State for Economic Growth, Energy, and the Environment Robert D. Hormats, Deputy Secretary of State for Resources and Management and Resources Jack Lew, Deputy Secretrary of State James B. Steinberg. While the 2010 transaction proved to be a financial boon to Telfer and other Uranium One executives, at least five members of Congress said at the time that the transfer of control over 20 percent of America’s uranium supply to a company owned by the Russian government threatened American national security. ARMZ and Uranium One had gone through the CFIUS review and approval practice a year earlier in 2009, when ARMZ announced that it was acquiring a 17 percent interest in Uranium One. That deal was consider a “covered transaction” under FINSA, and was reviewed and approved by CFIUS in 2009. 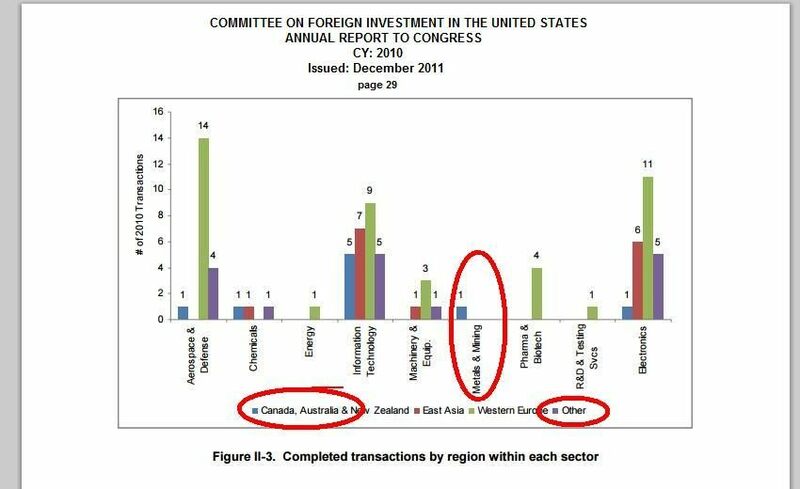 Surprisingly the 2009 Annual Report submitted to Congress by CFIUS inaccurately described this approved transaction by stating the company acquiring a minority interest was Canadian rather than Russian. Breitbart News has asked representatives from the State Department and Treasury Department, as well as former Assistant Secretary of State Jose W. Fernandez, to provide details on the CFIUS approval of the ARMZ-Uranium One transaction. Specifically, we have asked to learn the date on which ARMZ and Uranium One jointly notified CFIUS of the 2010 “covered transaction,” and the date on which CFIUS opened Case No. 10-40 to review that transaction. We also asked these three parties whether CFIUS Case No.10-40 was subjected to a statutorily required secondary 45-day investigation process or if the Secretary of Treasury and the Secretary of the lead agency jointly determined if such an investigation was required. We also asked if the State Department was the lead agency on CFIUS Case No. 10-40. Finally, we asked if Secretary Clinton disclosed to anyone involved in the CFIUS review and approval of CFIUS Case No. 10-40 that key executives and investors in Uranium One were significant financial supporters of the Clinton Foundation may have been significant financial supporters of the Clinton Giustra Enterprise Partnership. “I will decline to comment,” a spokesperson for the Treasury Department told Breitbart News on Monday. “By law, information filed with CFIUS may not be disclosed by CFIUS to the public. Accordingly, the Department does not comment on information relating to specific CFIUS cases, including whether or not certain parties have filed notices for review,” the spokesperson added. A spokesperson for the State Department also responded to Breitbart News on Monday. “By law, information filed with CFIUS may not be disclosed by CFIUS to the public. Accordingly, we cannot comment on specific transactions, including whether or not certain parties have filed notices for CFIUS review,” the spokesperson said. On Sunday, Breitbart News asked the Clinton campaign for comment, but has received no response.